"A remarkable wheat beer infused with a blend of Orange Pekoe and Earl Grey teas. It pours a light amber colour and will charm you with its sublime tea flavour and subtle lemon twist. A truly Canadian take on one of Europe's newest beer styles." the Look: this beer glowed orange in the glass with the typical cloudy look of a wheat beer. The head dissipated quickly leaving, well, nothing. the Smell: a hint of citrus, hint of malts, nothing overpowering. the Taste: fairly light in flavour, a little tang and limited linger. the Feel: again very light, hits a little on the front and back of your tongue. 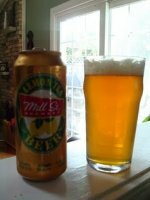 Overall: not a strong flavour, designed for summer drinking on a hot day, and it will fit the bill. I'd suggest drinking it cold, preferably on a hot humid day under a patio umbrella. I'd rate this beer a "B", average overall but a perfect fit for a humid Canadian summer.